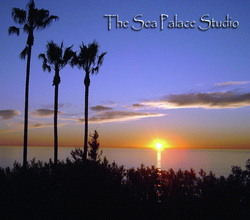 Nestled in the hills of Palos Verdes with panoramic ocean views, the Sea Palace Studio combines an inspirational environment, with professional assistance, to create music. Our experienced and dedicated staff takes pride in anticipating and exceeding client’s needs, with professionalism and discretion. Imagine being perched on a cliff, surrounded by the ocean, with palm trees and islands in the distance. One can get lost in the passing ships, wildlife, and the sheer beauty of nature. The first thing you notice when you come to the SPS is a Zen courtyard of tropical plants and THE sitting area. Tranquility and Serenity are present, and the vibe is on focus and productivity. Recent guests Steve Molitz and Darren Pujalet of jam band Particle said, "This environment helped us to do twice as much work in half the time." With a focus on quality and comfort, the SPS is a great environment for professional quality recording. An acoustically pleasing 20' x 12' room, with real maple hardwood floors, is floating over a parquet rubber floor about a half inch think. The floor reduces vibration, while enhancing a live, rich sound. The walls are suspended on joist hangers, padded, and finished with soothing green acoustic fabric. The ceiling is also padded, and has fiberglass insulation, with pleasant track lighting. There is an air conditioning system bringing in fresh, or AC air. The system is Pro Tools based, and our computer technician has built a superb machine that runs fast and smooth. We are known for our huge drum sounds. One of the most important assets of the SPS is our engineer, Joel Geist. He is patient and supportive and has an incredible talent of encouraging the artist to achieve the highest level of performance. Working with Joel is pleasant and rewarding. His dedication to the project assures the artist will be able to create their musical dream. Zen atmosphere at the Sea Palace Studio. My musical career began when I was 7 years old and my parents brought me to Mrs. Kim’s house for piano lessons. After 5 years and many recitals, I started playing the blues on the piano and had written my first two original songs. By the time I was 12 I was with the guitar. I practiced my scales and chords on a Martin acoustic guitar with terrible action and my fingers nearly bleed. I didn’t go to my senior prom, I played it. After high school I went to Australia for study abroad for six months. I returned to Los Angeles and went to USC with a music degree in Recording Arts. I left after the riots and moved to Colorado to attend CU in Boulder. I had a great experience there and met some guys in the first few weeks and started Tree Frog Faction. We quickly grew and were playing every weekend before going our separate ways. When I returned to LA I built my first studio called “the igloo” at a rental home in Torrance. This was a great learning experience on construction and studio design. I bought the home in Palos Verdes in 1998 and began dreaming about my next studio. It took a year to build with meticulous craftsmanship and quality. Once the Sea Palace Studio was complete I began working on my creative dream and started Sunday Skool with long time friend and bandmate Steve Aguilar. The skool has developed into much more than a jam band, it’s a combination of free expression and improvisation where there are no limits in ability or agility and touring pro’s are combined with musicians who just want to play a melody. Its always new and exciting and a great energy has been created and shared with the public in a new trend of webcasting. Producer! Recording Engineer! Bassist! Music Video Director! Jeremy Buck & The Bang! bassist extraordinaire, Joel Geist, got his start in the music biz playing guitar in high school rock bands based within the LA area. From there, Joel relocated to the midwest where he began his ascent to world-class studio engineer, producer, and music video director. Joel has recorded and/or produced nearly 3,000 songs. From tracks appearing in hit hollywood movies such as "Dude, Where's My Car? ", to directing music videos from the "Mission:Impossible II" soundtrack, to producing 8 seasons worth of videos for multi-million dollar clothing company "Hard Tail", Joel is a passionate artist/technician comfortable in a wide variety of hats! Joel has won,and has been nominated for, many music industry related awards. These include a RAMI for "Best Studio Engineer" in the northern Illinois area, and various LA Music Awards for "Best Music Video Director". Not only is Joel a highly skilled engineer and producer, who will help your project come to life, his enthusiasm, positive attitude, and technical knowledge continues to help artists and bandmates achieve their artistic dreams.